Marvel has released a trailer for the story mode of the upcoming Marvel VS Capcom Infinite. There is a lot to unpack here. Sigma, the big bad from Mega Man X, is joining forces with Ultron to take over both the Capcom and Marvel universes. All of this sounds about right, as fighting games don’t really rely on story. Fighting games do rely on characters though, and this trailer features a ton. 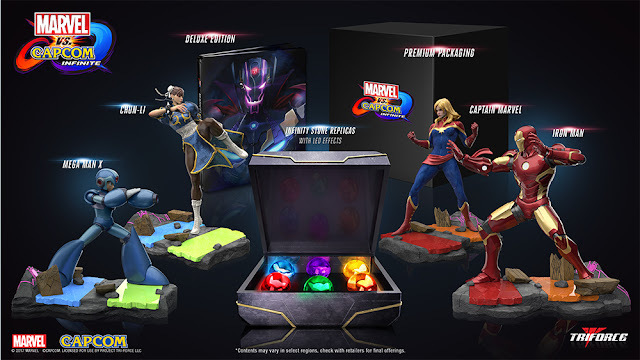 By my count, expect Hulk, Hawkeye, Thor, Rocket, Iron Man, Captain America and Captain Marvel to make appearances on the Marvel side of things, while the Capcom side of the roster will feature Strider, Chun Li, Mega Man X, Chris Redfield, Ryu and Morrigan. It is unclear if Ultron or Ultron-Sigma will be playable, but Sigma has been confirmed as one of the post-release characters. Speaking of release, Marvel VS Capcom Infinite will come in three flavors, a standard $60 edition, a deluxe addition which includes Sigma + 5 additional DLC characters and 6 Premium costumes, and a monstrous $200 Collector’s Edition that includes four statues and a set of Infinity Stones. Marvel VS Capcom Infinite will take us for a ride on September 19th on Xbox One, PS4 and PC.